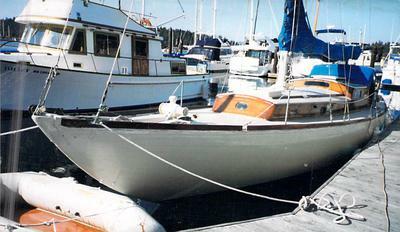 Frolic is now floating in the San Juan Islands and is needing TLC. 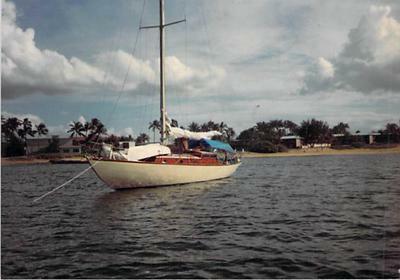 She is a Classic Island Clipper built by Fellows and Stewart. She is 44 feet with oak ribs & mahogany and a full lead keel. I have a penchant for things built when artistry was important. Frolic has good bones and I know I will learn a lot with this crazy journey while going broke at the speed of light. I bought Frolic from a gentleman who is now 87 and has incredible memories of sailing with his wife to Hawaii aboard Frolic years ago. While I have restored two old homes built in 1901, I have never restored a boat. Yes, I hear you laughing. As you might imagine, I am so grateful to all of you who share your passion, and for this website that provides much needed expertise, ideas and opportunities. Hi im writing from wales, is the yacht still up for grabs? As I'm looking for something over 30 foot which she is, as I was let down by a friend on his sixthy footer (to borrow for tem months). It to raise funds for miletery charitiess for the men and women injurued whilst serving their country. If you still have her I would be glad if you could contact me. I have an Owens cabin cruiser 1964. I obtained her in hopes of restoring and then trading for eq. a sailboat (deepwater). My mission =bBelize to start a non- profit Healing herb import company. I have been studying healing herbs since I was 12yrs young. I have met certain people and have recieved information that, I believe few people are privy to. Back to your boat, its a beaut and I think a lot less work than I have involved w/my Owens. At the risk of sounding Fanatical. I feel like I have a limited amount of time before I wont be aloud to come and go freely so believe me when I tell You this is only for me in the fact that I need to help others or I feel everything in my life is for naught. So if you have to let her go w/me she will serve a purpose other than making someone already rich a little richer. I just feel a need to use what I was given to make the world better. She looks like a nice boat. There is the Salt Society in Victoria BC they repair them then sell them. Not sure if they have them in the states where you get a tax rebate. But the ? does it run would be can it be moved to BC?